Problems in the press shop sometimes are blamed on poor press-setup practices, when the source of the problem actually may lie with the die design or the press selection. Press selection usually is predetermined by process engineering or tool engineering prior to tool construction. At this early phase of process development, engineers often estimate pressing forces to ensure that the press selected has adequate force capacity. They also will estimate die size to ensure that it will fit in the press. Unfortunately, little consideration, if any, has been given to the negative effects of off-center loading on part quality and die life. Later, when the shop completes construction of the die and sets it in the press for initial tryout, the die setter can measure actual load distributions using a press tonnage monitor. 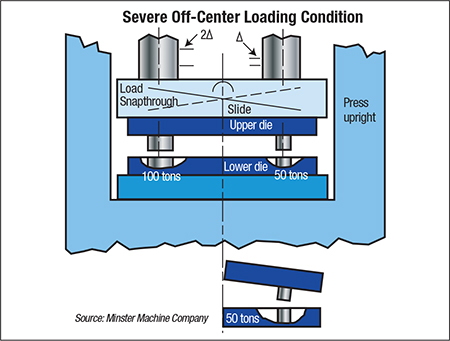 If he discovers large off-center loads, little can be done in terms of die-setting practices to improve the situation. Maintaining an even distribution of the work load across the slide face (ram) is critical to ensuring good part quality, improving die life and reducing press maintenance. Uneven distribution of working forces in a die across the press slide can cause the slide to tip and move laterally in the direction of the greatest force. If this movement occurs with the punches engaged with other die components, excessive wear or damage can occur. As a rule, stampers must first recognize the potential for misalignment due to ram tipping, and then manage or eliminate this potential during die design. It may not be practical to design and build progressive dies with perfectly centered loads. But, with excessive tipping moments present, the die must be able to redistribute and balance the cutting and forming loads as evenly as possible. Ignoring the distribution of press loads can lead to die and press damage. Stampers must understand the differences between a centered load and a centered die. Fig. 1 depicts a simple die centered in a press. The punching action generates a 100-ton load on the left side of the die and a 50-ton load on the right side; even with the punches equally spaced from the press centerline. This situation generates a large left-to-right tipping moment. Setting a die in a stamping press with a single slide connection requires careful centering of the load under the slide connection. Although a centered load always represents good practice, it is particularly important in this type of press. Visualize the slide in a single-connection press acting as a teeter-totter. The slide connection, serving as a fulcrum, is positioned on center. It keeps the teeter-totter (slide) perfectly balanced. A centered stamping load prevents slide tipping and the associated pressure working against the press gibbing. Selecting a straightside press with a two-point connection significantly reduces the teeter-totter affect with off-center loads. However, this does not mean setting a die in a machine with a two-point connection will serve as a cure-all for slide tipping. A slide with a two-point connection and single-end drive (Fig. 2) is subject to angular misalignment proportional to the amount of torque transmitted through the crankshaft. This angular misalignment causes the press slide nearest the drive system to reach bottom dead center first. 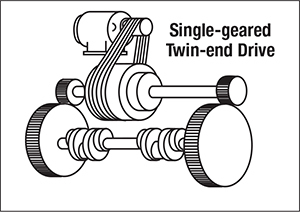 However, a twin-end drive arrangement (Fig. 3) drives the crankshaft equally from both ends. This provides a great deal more accuracy, especially under load, as compared to a single-end drive system. Widely spaced slide connections also can combat the negative effects of off-center loading. By placing the connection points toward the outside of the slide, the greater distance between the connection points increases the stability of the slide and enables the press to resist the effects of tipping under off-center loads.